I took my daytrip to my beloved Philadelphia last Sunday. (I will share all about my quick little trip over a few posts!) While at my favorite place in the city, the Reading Terminal Market, I stopped by the Termini Bros. stand for their cranberry pistachio biscotti. I had been craving them for breakfasts since December! 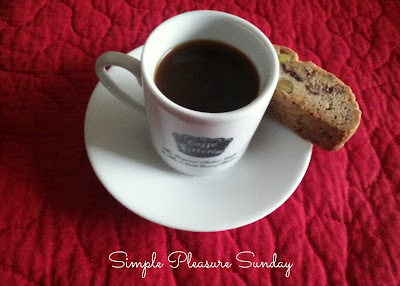 Accompanying my espresso, I savored two or three of these small slices each morning, for the next six days. They were delicious. 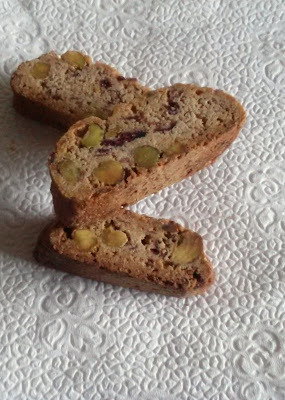 Other packaged versions of this kind of biscotti on the market can taste like crunched up fruit loops, the whole thing about the same texture. Not these. Like a lot of Italian cooking, you can actually taste the ingredients. So flavorful! Plus, the cranberries are chewy and the nuts have their firm yet smooth texture. You think of biscotti as hard cookies, even the word means "twice baked, " but these particular cookies are firm and crisp, not too hard nor completely crunchy. This high quality product was simply well done. The out of the ordinary purchase was a special little treat. I appreciate adding even more of an Italian touch to my breakfast! Maybe I should consider making my own as I love them enough!